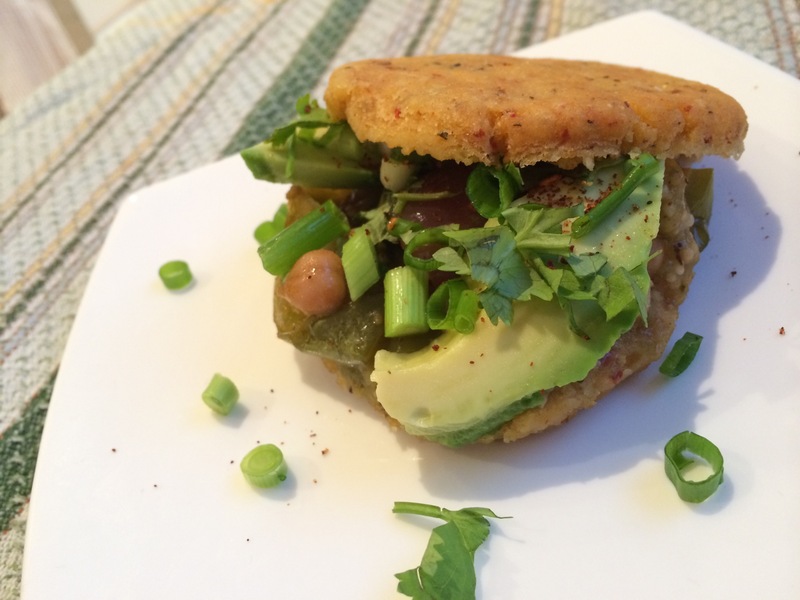 The first time Ashley and I made arepas was last summer for Vegan MoFo. We had a bit too much hummus around, and needed a different way to eat them — so we put our Mexican-inspired Huacamole and Hummusalsa to good use topping our arepas. 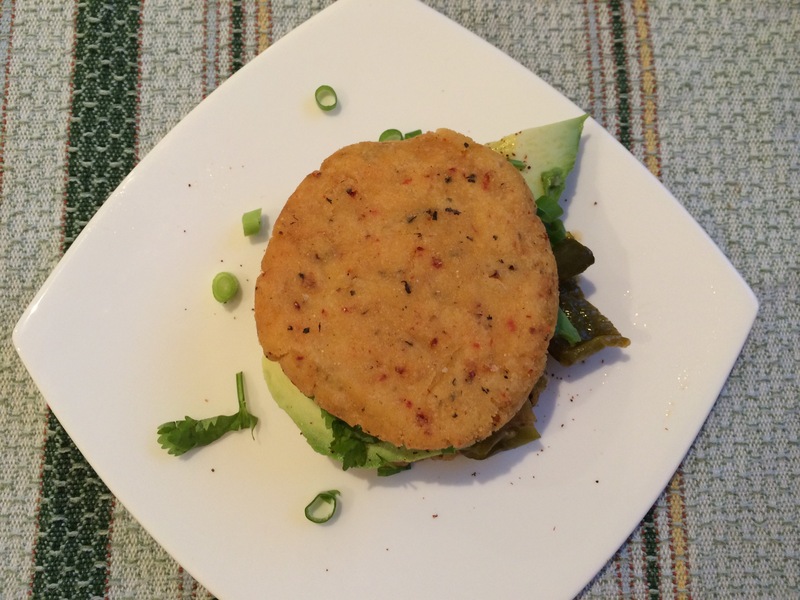 Since then, I’ve been making arepas as an easy weeknight dinner for Mr. KitchenOperas and I. We usually top them with whatever veggies and protein need to be used up in the fridge. And this time, I’ve put together my favourite Tex-Mex flavours together: green poblano peppers (which can be sweet or slightly spicy) and green tomatillos with all of their zesty lime-like flavour! For protein we’ve got chickpeas, which help turn the arepas into a filling meal. Add some avocado, fresh cilantro, and green onions, and you’ve got a ton of flavour that you can enjoy open-faced, or like a little arepa sandwich! Arepas are one of my favourite weeknight dinners. The dough comes together quickly, and can rest while you prepare the tomatillo & poblano filling. Top with your favourite toppings — I like slices of avocado, green onions & fresh cilantro, but you could also add pickled jalapeño slices or your favourite hot sauce or vegan cheese. Makes 6 arepas, enough for 4 people along with a side salad. Begin by preheating the oven to 425F. Prepare the Arepa Dough: In a mixing bowl, combine masa, salt, oregano, and cayenne. Add the water, and mix well with your fingers until the mixture forms a ball of dough. Let the dough sit for a minimum of 30 minutes while you roast the veggies. Prepare the Tomatillo & Poblano Filling: Put all Filling ingredients in a roasting pan and toss to coat the veggies with the oil & spices. Roast (uncovered) at 425F until the tomatillos are soft, about 40 minutes. Cook the Arepas: Form the dough into 6 balls of dough. Flatten out each ball into a disc. (I tend to like them “English muffin-sized” — they don’t puff up at all when you cook them so the size you make the dough discs will be the size of your finished arepa). Add a tablespoon of oil to the pan. Heat the pan over medium heat, and add as many arepa discs as will fit without crowding. Cook for 3-5 minutes on each side, until each surface has brown spots. Repeat to cook the remaining arepas. Assemble the Arepas: Split each arepa in half with a sharp knife. Take one half, and add a scoop of the filling. Top with avocado, green onions, and fresh cilantro. Enjoy! Arepas, eh? This is a totally new thing to me. I’m going to have to look into this some more, as they sound right up my alley.